Hop on the Bus, Get Schooled on Local Food and Value-Added Production & Processing! Farmers of all experience levels are invited to hop on the bus and gain a better grasp of the opportunities and challenges of our local food systems. 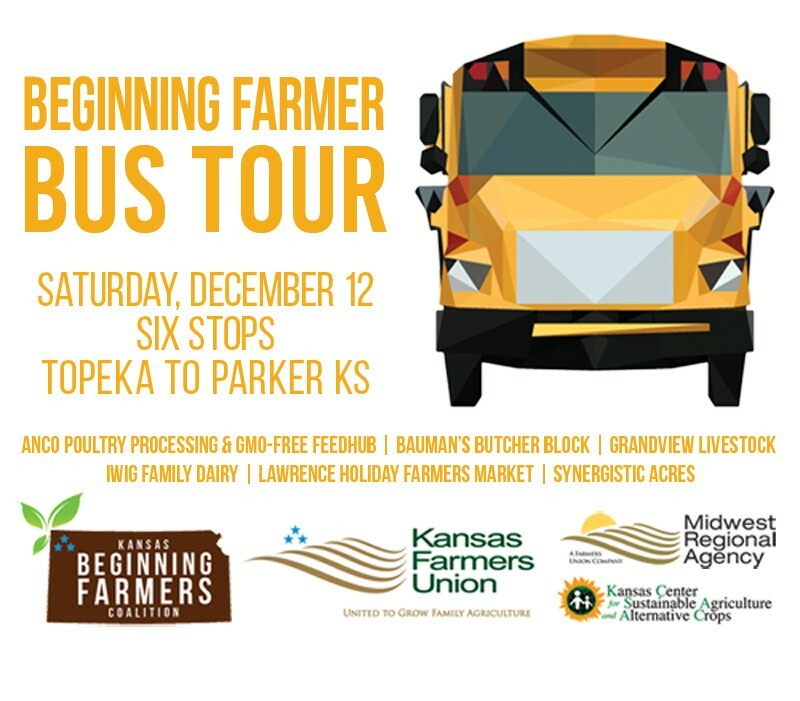 The Kansas Beginning Farmer Bus Tour follows convention and a special beginning farmer rate is available thanks to the Midwest Regional Agency. Since 1910, the Iwig family has been raising cows and producing milk for Kansas families. In 2004, Tim and Laurel took the farm to the next level with the opening of its dairy bottling and retail service, providing bottled milk to grocery stores. Iwig Dairy recently shifted marketing strategies, increasing direct sales of its products to consumers with its three retail locations. Products include flavored milks, butter, and ice cream. The Lawrence Farmers Market is the state’s oldest, continuously operated, producer-only farmers market. With more than 100 vendors, the market runs from April to November. The annual Holiday Farmers Market, held indoors at the Holidome, attracts 1000s of shoppers looking to purchase locally grown foods and hand crafted items. The Bauman family began its adventure in ag in 2001 when John and Yvonne Bauman purchased 180 acres in Anderson County. Today, they, along with their six children and two daughters-in-law, run an enterprise where they do everything from raise pastured poultry and eggs, beef, and row crops to process a gamut of local ag products. Rosanna developed a passion for poultry, later realizing that lack of processing capacity was holding back the growth of local sales. So she got her HACCP and opened ANCO, Kansas’ only on-farm, USDA-inspected poultry processor. Earlier this year, the family purchased an Ottawa beef plant at auction. Bauman’s Butcher Block processes cattle, hogs, goats and sheep under USDA inspection. Employing “some of the best meat cutters in the state” the Butcher Block specializes in working with direct marketing producers. Synergistic Acres’ Jeff and Laura Hamons didn’t grow up on a farm or even have any farmers in their families. Instead, their path to farming comes from a strong belief in the importance of people having access to healthy food. They’ve chosen to focus their efforts on producing meat instead of vegetables because they believe animals can be raised humanely and happily. On their Parker KS farm, cows are fed only grass; pigs are given a mixture of woods and pasture in large paddocks; and heritage breed turkeys and laying hens are allowed to free range in the pastures all day long. Grandview Livestock’s Greg and Ann Christiansen got into meat goats when nothing would grow but brush and weeds after having a third drought in five years. In an average year on their Parker KS farm they’ll have more than 600 commercial does kidding, along with raising corn, soybeans, wheat, hay and cattle. They also raise livestock guardian dogs that live with and protect the goats that are on 6-7 different pastures within 20 miles of their home. Known as the Goat Commander, Greg is the author of Raising Meat Goats in a Commercial Operation. In the book he draws on his 14+ years of experience in raising meat goats on a commercial scale to explain the principles of managing meat goats as a viable farm business. Kansas Farmers Union is the state’s oldest active general farm organization working to protect and enhance the economic interests and quality of life for family farmers and ranchers and rural communities. We believe family ownership of farm land is the basis for the world’s most viable system of food and fiber production, and that maintaining this family farm system will preserve our natural and human resources.